I borrowed this book from York library (York Explore) months back. It was one of the books stored in the reserve, in the basement. Before I returned it I took a scan of its inside front cover and first page, with the old-style paper pouch and its small yellow card, as it reminded me of the libraries of old, particularly those of my 1970s childhood and 1980s adolescence. Every ‘bookish’ child remembers the library of their childhood. My mum’s was a Carnegie library in Hull. Mine was Acomb library. I remember us driving there, would be the early to mid 1970s, parking in the car park behind. Remember concrete columns on the way in, a fish tank just inside the door, and the smell of the pages of Beatrix Potter books. Can also remember where the teenage section was, exactly where it was, in the 1980s. I love this image because of that yellow card, mainly. As I recall, these were the way books were checked in and out. Can’t remember exactly how it worked, but I think they were kept in long wooden drawers. Please feel free to share your memories of your own ‘first’ library in the comments section. Many people I know don’t have a library card now, though they may have done when younger. So a question, too: if you don’t use local libraries now, why is that? It was a nice simple system. Your ticket was a little cardboard pocket. 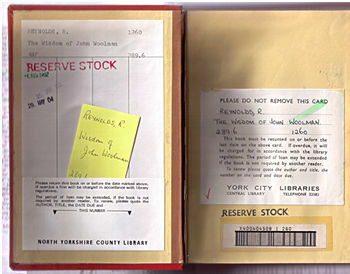 The yellow card from the book went into the pocket and they were filed together, first by date due back, then (I think) by Dewey number, in long open boxes. The cards for the overdue books were all at the end of the set of boxes, which shuffled up in the space available as the days ticked by. The current day’s issues were in easy reach. It was nice to be able to see how popular a book was by looking at the old date stamps. Now, usage information is gathered, invisibly, by the library computer and is more about us than the books! my family all went to the library and had books out. I loved the childrens library, spend ages in there. My mother was in the adult library and I would go in there with her too. Often being allowed to take a book home from the non fiction section. There was a section where newspapers could be read if I remember correctly. It cost us a penny (240 to the pound then) to join for 2 years. I wonder if children are encouraged to go there nowadays. Perhaps schools could tell children what a good place it is to go. People could go and browse newspapers also. I hope York parents will make every effort to go with their children and to read themselves in this day and age of tv and radio etc. I can remember the slope up to the doors, having to throw my weight a little into the act of opening the door against a heavy spring, the coconut style matting in the entrance, the murmured conversations and my quiet awe at the staff who were entrusted to look after all these books. I can remember the childrens section, and graduating from that section to the ‘adult’ section as the years passed. In the subsequent years i very, very occasionally stumbled across a Science Fiction author i hadn’t read, which is a testament to the libraries of the 70s, even a provincial library could satisfy the literary thirst of a teenage boy and a complete introduction to any genre you care to name..
Havent been in that library for years. It became increasingly difficult to find new books i wanted to read, having exhausted the back-catalog over a decade or so, i was a little flush with cash in my 20s so tended to buy books to read, and now i tend to buy second hand books over the internet..
i really must get a library card, to satisfy my curiosity as to how they have changed.. I visited my beloved local library on the Wirral almost every day in the holidays as a child in the 70’s and 80’s, armed with mine and my sisters cards and my also parents cards so I could get books out of the adult section. I loved the system of cards and stamps so much that I was desperate to become a librarian until my mother told me that they don’t sit around all day reading. Today I am the only one of three siblings who doesn’t work in a library. Until recently my local library was Northallerton which I used regularly, but on moving to York three years ago I was disappointed at the lack of non-fiction books in Explore. It’s not even the case that the cafe takes up too much room, there just aren’t many books on the shelves. I don’t look at the fiction section so I can’t comment on that. Sorry to be miserable but I expected a city centre library to be a treasure trove. For fiction I download free classics onto my phone. Having raved recently to my sister about reading The Woman in White on my phone, she took it out of her library and struggled home with a heavy three volume novel. my childhood library has been shut for many years.many families with kids are deterred from using the central library in Preston because it’s full of yobs messing about on the PC’s.Nothing is ever said about it. They probably think by getting yobs to cross the portal they are doing a marvellous job in attracting a ‘non consumer variable’ either that or that are frightened of being chinnned.